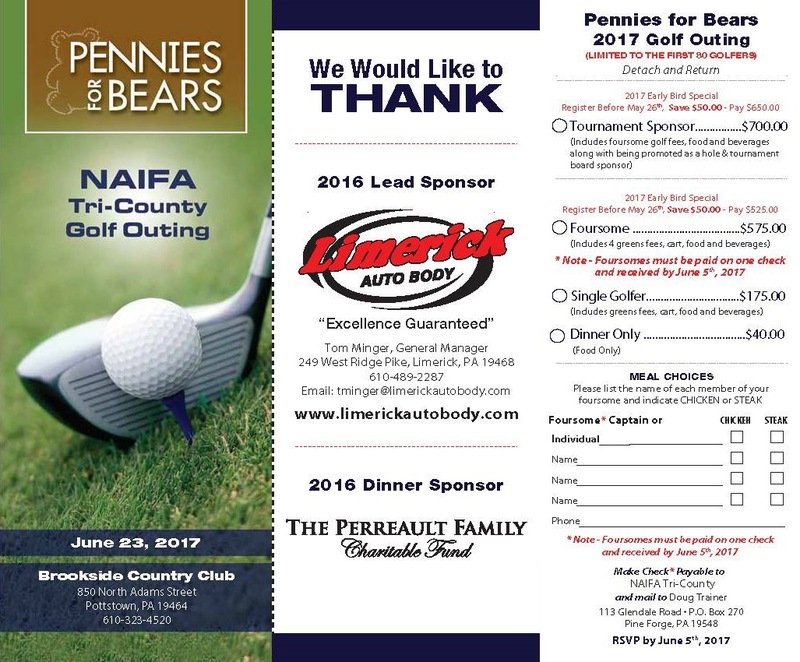 Limerick Auto body is proud to announce that once again we’re the lead sponsor for the upcoming Pennies for Bears Golf Outing event coming up on June 23rd. Learn more about this event and how you can get involved. Pennies for Bears was created back in 1987 to serve a very important function in the community. It started with the plan to provide teddy bears to emergency personnel to give out to young children impacted by an emergency. An accident or other emergency calls involving children can be very traumatic for them, and the simple act of a police officer, firefighter, or EMT giving them a teddy bear can help them through it. Pennies for Bears expanded in 2007 to not only purchase bears to give out to the local emergency responders but to provide a scholarship to a deserving senior. To be eligible for consideration, the senior will have to have a financial need, demonstrate academic achievements, shows a potential for leadership, and provides community service to the local community. This is a cause very close to our hearts, and we’ve been sponsoring this event for at least the past 15 years. This year event falls on June 23rd with a shotgun start at 8:30. Your entry fee earns you an 18-hole round of golf, a golf cart, a continental breakfast, hot dog lunch, steak or chicken dinner, and prizes. You can enter as a foursome or a single golfer. Signing up as a foursome before May 26th earns you an early bird discount of $50 off. Also, keep in mind that foursomes need to be registered together on the same check with the last day you’re able to register being June 5th. Come on out to have an amazing golf outing while supporting this amazing cause. A ton of fun will be had by all, and everyone ends up a winner by participating in such a worthwhile event.